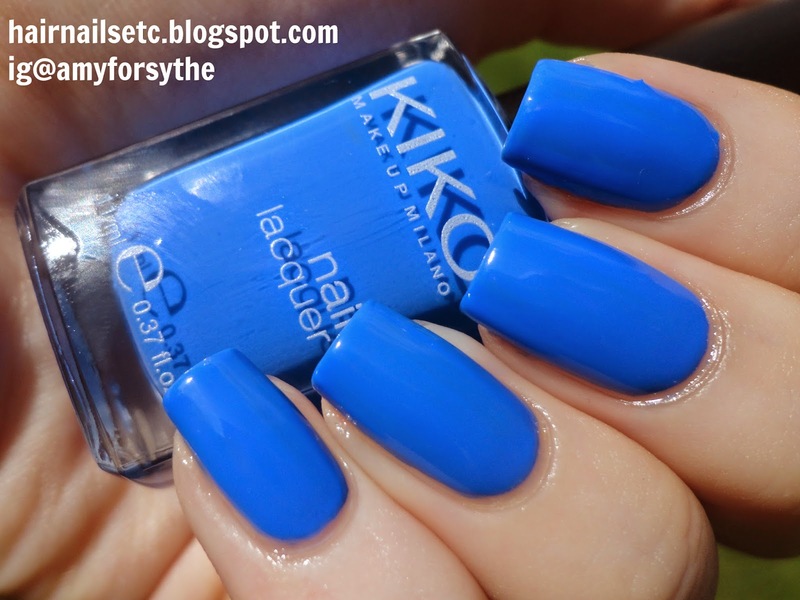 Today I have a quick review of the Kiko polishes I bought recently. 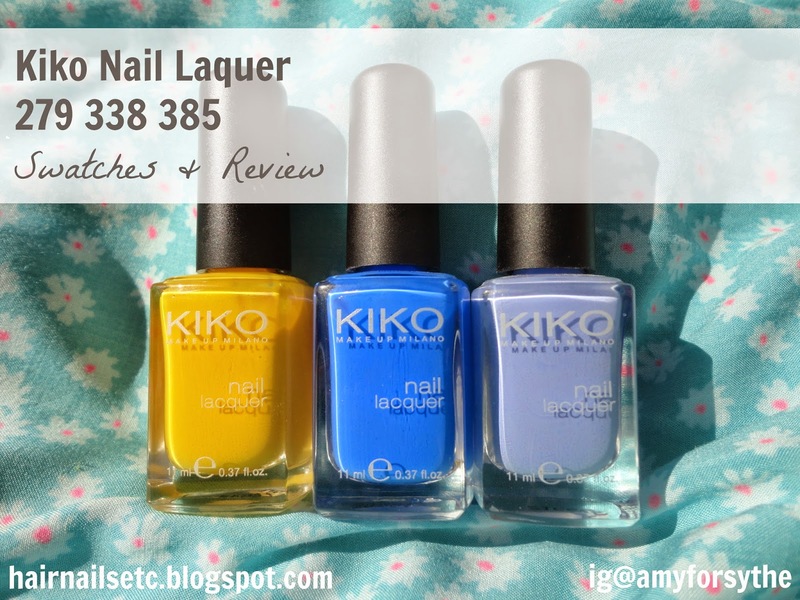 Kiko have an amazing selection of colours and I had a hard time narrowing it down to just three. I decided to go for three creme polishes to fill a few (possibly imaginary) gaps in my collection! The bottles only have a number on to identify the polish but I looked up the names on the Kiko website and have included them as well. First up is No. 279, Yellow. I would describe this as a bold sunny yellow, or maybe an egg yolk yellow? The polish was nicely pigmented, though a little thick and streaky, I had to use three coats to even out the streaks. 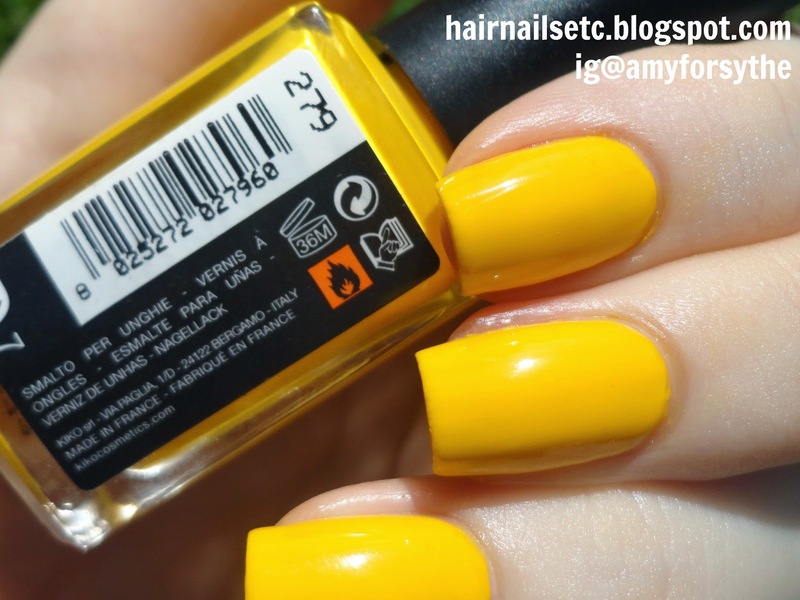 Having said that I do think this is relatively good for a yellow polish, which are typically poor, so I'm impressed. Now I just need to find a good cool yellow as that would probably suit my skin tone a lot better. Next is No. 338, Light Lavender. 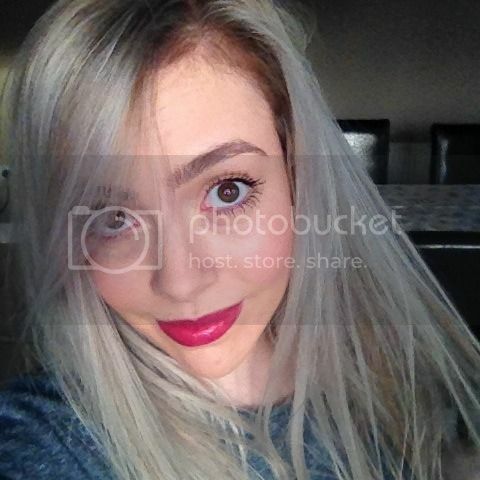 This is such a pretty lavender blue colour, which is flattering against my pale skin tone. The formula was also lovely, I needed just two coats for full opacity, and it was very easy to work with. However I do find the flat edged brush a little inconvenient as it doesn't fit nicely to the cuticle, so a little patience is required to get a nice curve there. Finally I have No. 385, Pastel Blue. 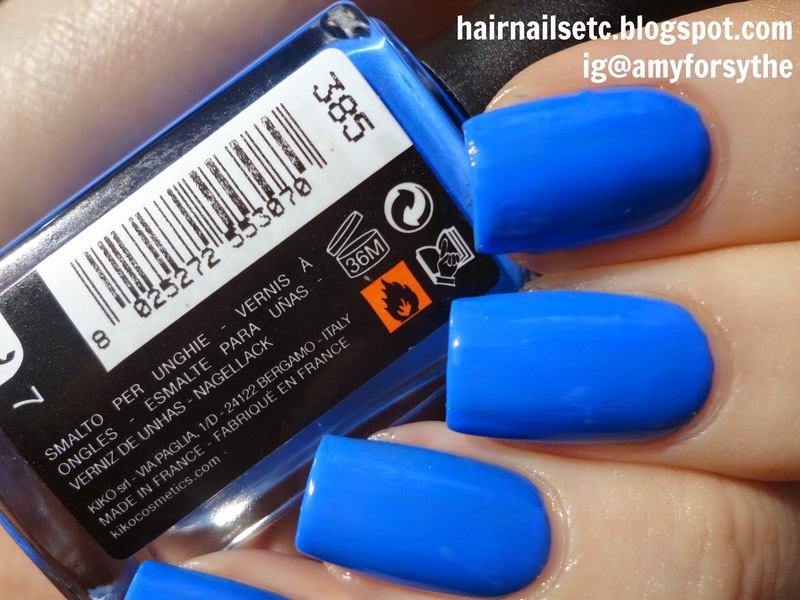 For me this isn't pastel at all, it's a bright, bold cobalt blue. It is absolutely stunning. The formula is almost perfect, I used two coats but I'm sure you could get away with just one if applied carefully. 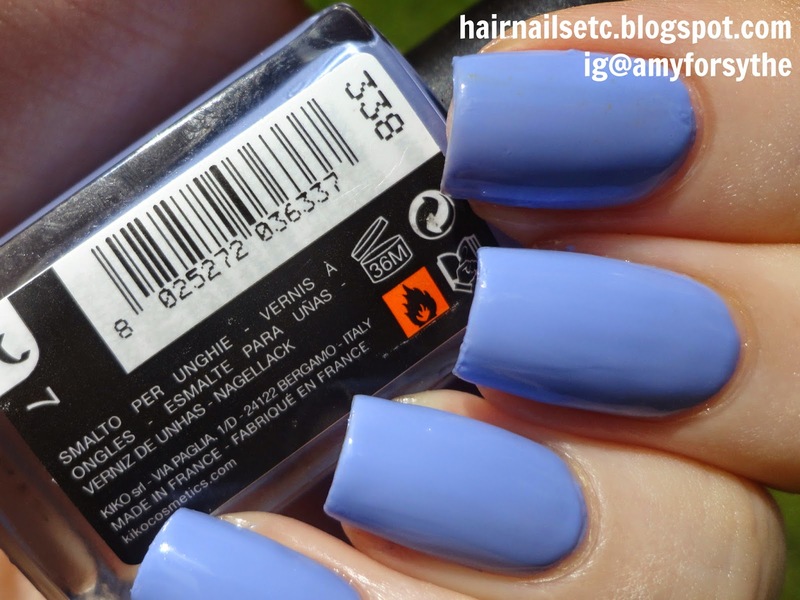 Now I can't be the only one wondering if this is a dupe for the original Sally Hansen - Pacific Blue (now discontinued). Unfortunately I don't own Pacific Blue as the Xtreme Wear collection isn't sold in the UK but judging from pictures I have seen this could be a very close dupe. Overall, I am very happy with the polishes I chose, and I'm impressed with the quality, especially considering the price. 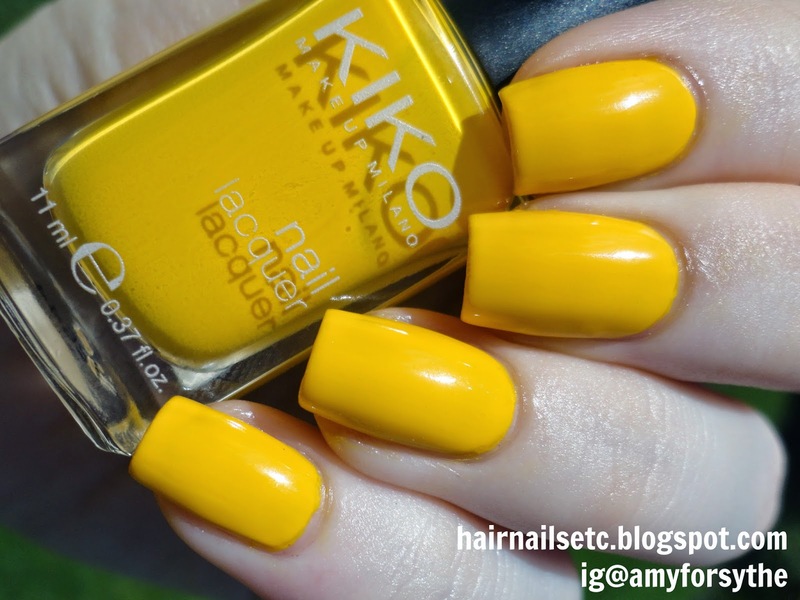 Hopefully Kiko will open a shop in the North West soon, so I can try out some more from their range. If anyone is more familiar with this brand, please leave your recommendations in the comments, I'd love to know what to look out for next time!